But as I drove in to the office this morning, I noticed that some of those little cherries were starting to ripen – getting nice and red after a weekend in the 80s and 90s. It was a welcome sight, if only because they’re a part of who we are. In fact, with the possible exception of the Garden of Eden, it’s hard to think of a place more closely linked to a particular fruit than Traverse City is to cherries. We don’t just have a Cherry Festival. Everything in Traverse City seems to have a cherry theme attached to it, from the Cherry Capital Airport, the Cherry Tree Inn and the Cherry Bowl Drive-In to the Cherryland Electric Cooperative, the Cherry Bomb Lacrosse Tournament and the Cherry Hill Boutique. It’s a rare restaurant that doesn’t have at least one cherry-laced sauce, dessert or entrée, and a rare gathering where bowls of dried cherries aren’t on hand for snacking. 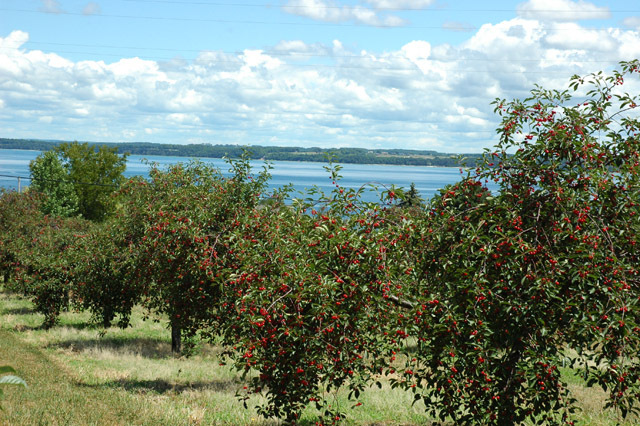 Michigan’s cherry-producing region starts about 100 miles down the Lake Michigan coast, in the area around Hart and Oceana County, but it gradually intensifies as you get closer to the communities around Grand Traverse Bay, which is really the heart of cherry country. The coastal counties of Benzie, Leelanau, Grand Traverse, Antrim and a bit of Charlevoix are far and away the most productive cherry country in the state. For over a century, the inhabitants of the Traverse Bay region have regarded these bright little fruits as a sort of botanical mascot. They’ve been part of the Traverse City experience ever since the first cherry tree was planted here in 1852 by the Rev. Peter Dougherty, a Presbyterian missionary to the local Ottawa and Chippewa Indians. No one expected Dougherty’s tree to survive so far north. Instead, it flourished – and it wasn’t long before arriving settlers began planting cherries of their own. What they discovered was that this region’s unique geography -- gentle hillsides surrounded by lakes and bays of deep cool water – play a crucial role in moderating spring and winter temperatures. 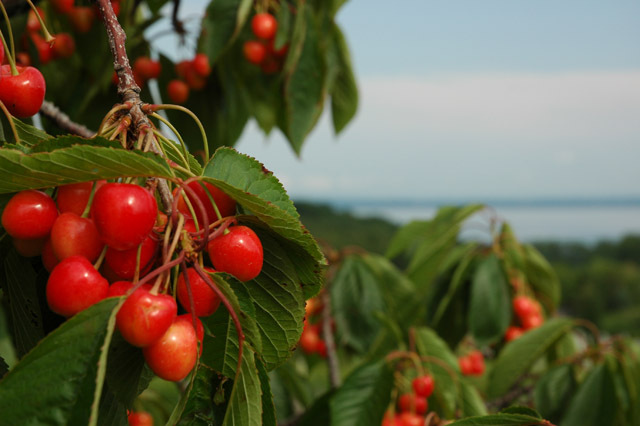 Over the years, cherry orchards began to spread across the hills of the Old Mission and Leelanau Peninsulas, and today the Traverse City area produces over 75 percent of the world’s tart cherries. Back in 1923, local churches began a tradition known as the Blessing of the Blossoms, to pray for a successful crop. 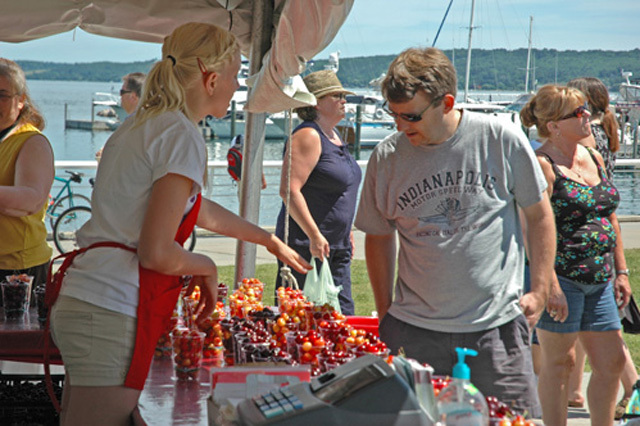 That simple blessing gave birth to an even larger celebration: the National Cherry Festival. 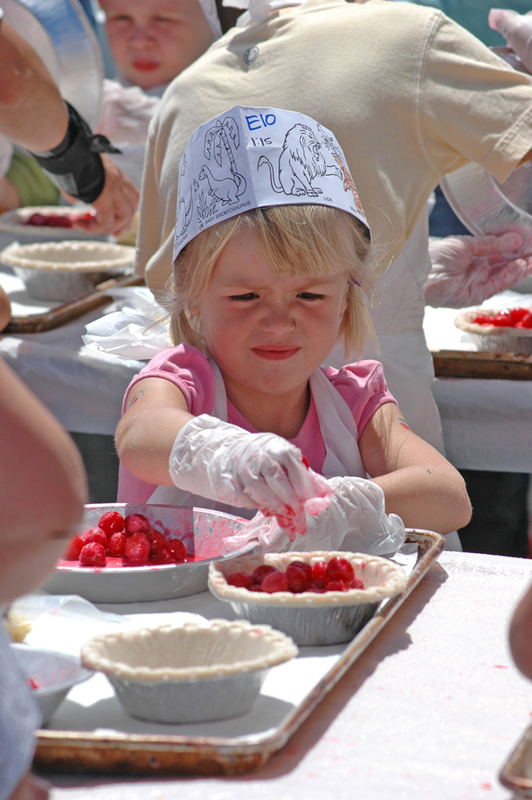 Each July, the week-long festival draws hundreds of thousands for parades, music, fireworks, games and competitions -- including cherry pie-eating and pit-spitting contests. But the heart of the festival is still cherries. Its organizers constantly work to come up with new and unusual uses for the area’s favorite fruit, whether it’s in a familiar dessert, a basting sauce or even on pizza. 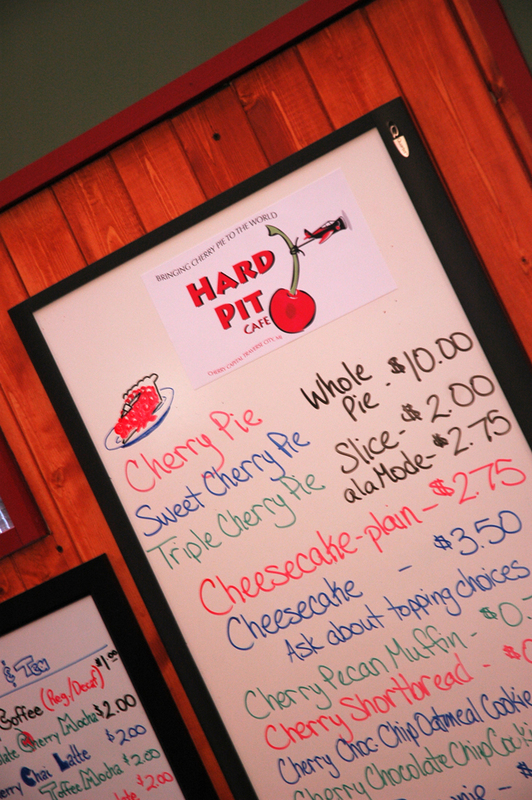 In fact, in Traverse City you’ll find cherries in everything from beer and wine to cherry vinaigrette salad dressing, bratwurst and beef patties. The week-long festival, now includes a multitude of wine-tastings, food samplings, and competition for cherry-based recipes. And there are orchard tours, too. There’s a reason for this ceaseless creativity: American tastes are changing, and people are eating less pie. If cherry farmers are to survive, they know they have to find new markets for their products. One of the earliest pioneers in this effort was Leelanau butcher Ray Pleva, who first mixed cherries with meat back in the 1980s. His Plevalean burgers are now served in school cafeterias in 18 states. Today Pleva is heading in yet another direction, marketing skin care products that blend cherries with natural oils. In fact, the cherry industry is devoting a good deal of attention to health and beauty products, trading on the nutritional and anti-inflammatory qualities of cherries. Another wonderful way to encounter cherries is the way we locals do: at a local farm market or U-pick orchard. (Two good ones to try are McManus Southview Orchards, just south of town on Garfield Rd., and Gallagher’s on M-72 just west of town.) Standing in the orchard, with a glimpse of sparkling blue horizon visible between the heavy-laden branches, it’s clear that cherries chose a special place to make their own.